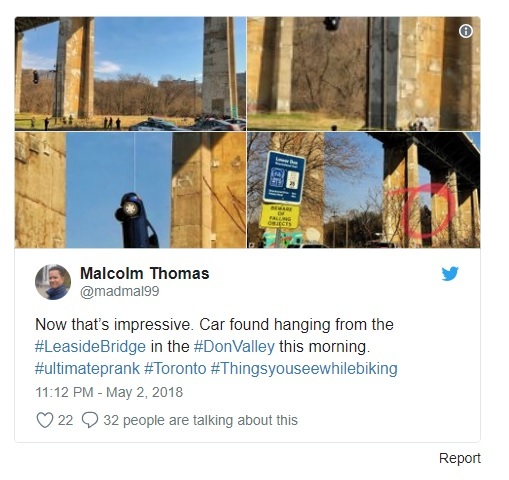 Canadian police say they believe pranksters are behind a car found suspended from a Toronto overpass. 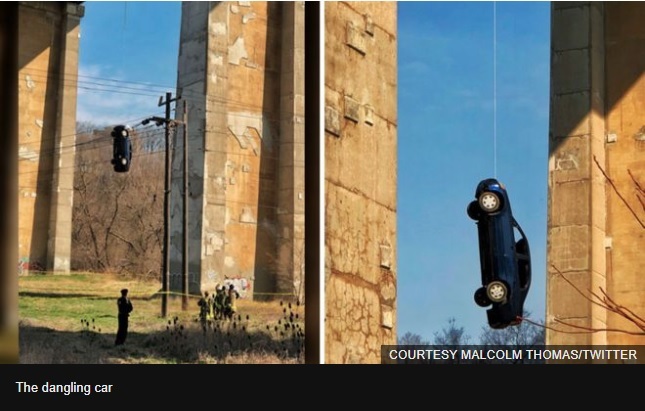 The blue sedan, empty and in disrepair, was spotted hanging from the Millwood Bridge early on Wednesday morning. 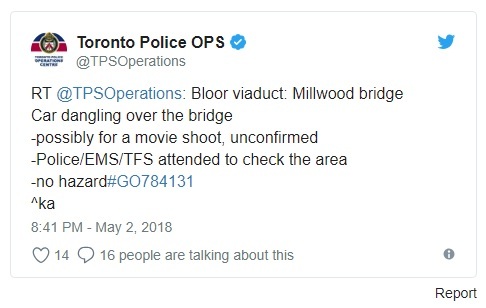 Toronto police originally believed it was part of a movie shoot but later confirmed no filming permits had been issued. Fire services were able to safely cut the car down by midmorning. Police have launched a "public mischief" investigation into how the Honda Civic came to be hanging by cables from the overpass. "This incident resulted in the use of significant resources that were not available to attend to genuine emergency calls for service," police said in a release. The busy roadway is used by commuters to access the city centre. University engineering students in the US, Canada and the UK have a history of similar tomfoolery. In 2009, one antic from University of British Columbia students failed when the cables holding up a suspended car from a bridge in Vancouver broke, plunging the vehicle into the water. Five students were caught and threatened with criminal charges. In 2001, UBC students claimed responsibility for dangling the shell of an old Volkswagen Beetle from the railing of the Golden Gate Bridge in San Francisco. In 1994, MIT engineering placed a police car on the roof of a campus building and it had to be disassembled to be removed.